The Best Make-Ahead Lasagna recipe that is also freezer friendly is made with a rich sausage sauce and loads of cheese. This will be your go-to lasagna recipe guaranteed! Few things are more deliciously comforting than a plate full of delicious hearty cheesy lasagna. Truth be told, I didn’t have a great lasagna recipe until I tried this one. It’s what lasagna dreams are made of. It’s rich, saucy, cheesy, simple to put together (thank you canned tomatoes and no-boil noodles), and just all around awesome. 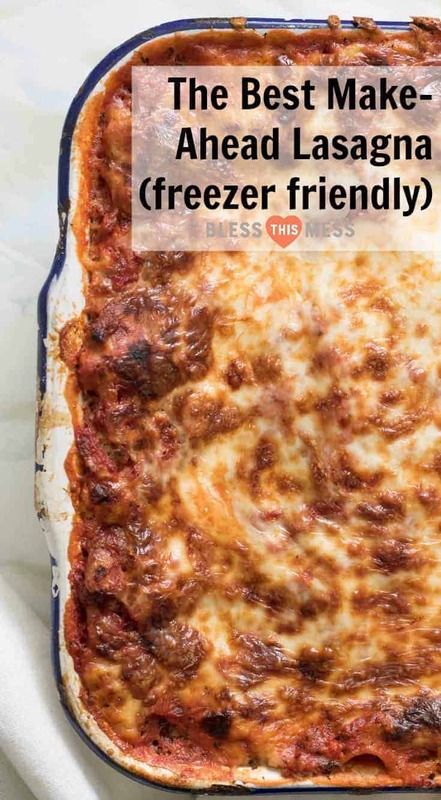 This is for sure the best make-ahead and freezer friendly lasagna recipe out there. I can’t wait for you to make it! 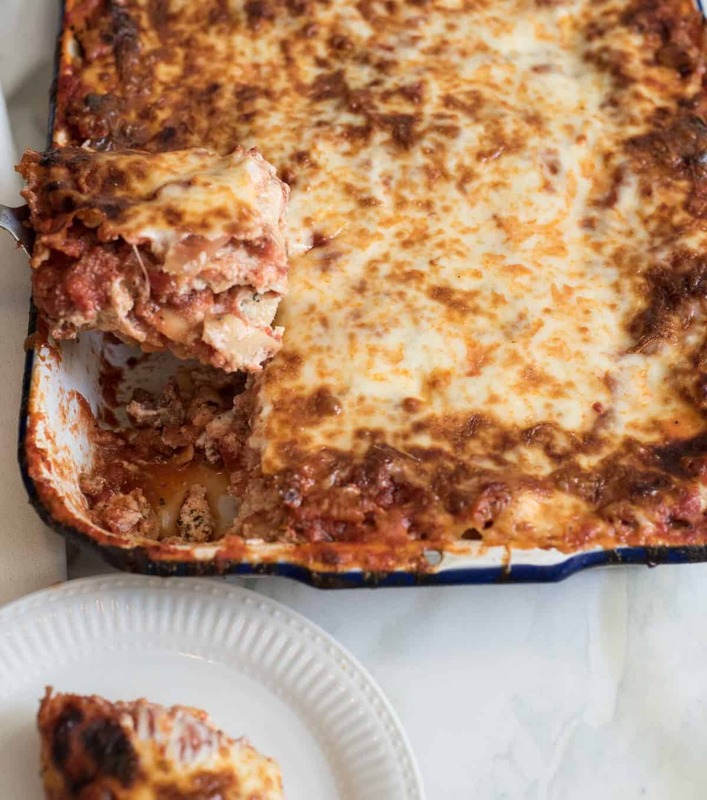 This lasagna recipes hails from the new America’s Test Kitchen cookbook The Complete Make-Ahead Cookbook: From Appetizers to Desserts 500 Recipes You Can Make in Advance. It’s a good one! I love this book because there are 500 recipes you can make ahead of time – 500! Lots are freezer-friendly too. It goes through the process of how to make, store, and then cook each recipe. It’s awesome for busy moms. I do a lot of my dinner-making at lunch or early afternoon while I only have two little people at home. Once after school time hits, we have homework, karate, chores, Cub Scouts, and more. It’s great for me to have a plan for dinner but not have to be actively in the kitchen at that time. The Complete Make-Ahead Cookbook is perfect for that kind of thing. I also love it for planning dinner parties, family functions, and other events where you don’t want to be busy in the kitchen right before the meal. Not only can you make it ahead of time and keep it in the fridge for up to 24 hours, you can freeze it, too. I make a double batch of this recipe in the morning or early afternoon, stick one in the fridge to cook for dinner and wrap one up and stick it in the freezer. Cook once and eat twice! I love having meals in the freezer for busy nights (hello DIY house building) or to have ready for a friend in need. I’ve delivered many freezer meals to neighbors and friends just when the thought strikes me. It’s such a gift for myself and others to have homemade, comforting meals in the freezer for when we need them. It’s great for prepping for big crowds, too. In fact, I have tons of family coming into town this weekend (my son is getting baptized on Saturday! ), so I’m making 4 pans tonight that we’ll cook up tomorrow after the baptism. Hurray for prepping ahead for parties and family gatherings! This recipe makes a big lasagna so make sure you have a 9×13 inch pan. I like to keep these foil pans in my pantry if I’m making a lasagna for the freezer. I don’t have to worry about tying up my dishes or getting them back if that lasagna makes it to the home of a friend. This recipe is great for company (it’s that good and you can make it ahead of time!). Serve it with some of my favorite no-knead bread and my favorite fall salad (apples, bacon, candied nuts, and shaved Brussel sprouts…so good) and you are ready for company in no time. Fresh basil in this recipe is SO good. Splurge on it if you can, but dried works well, too. The Complete Make-Ahead Cookbook would make a great gift for you or a friend. Definitely check it out! 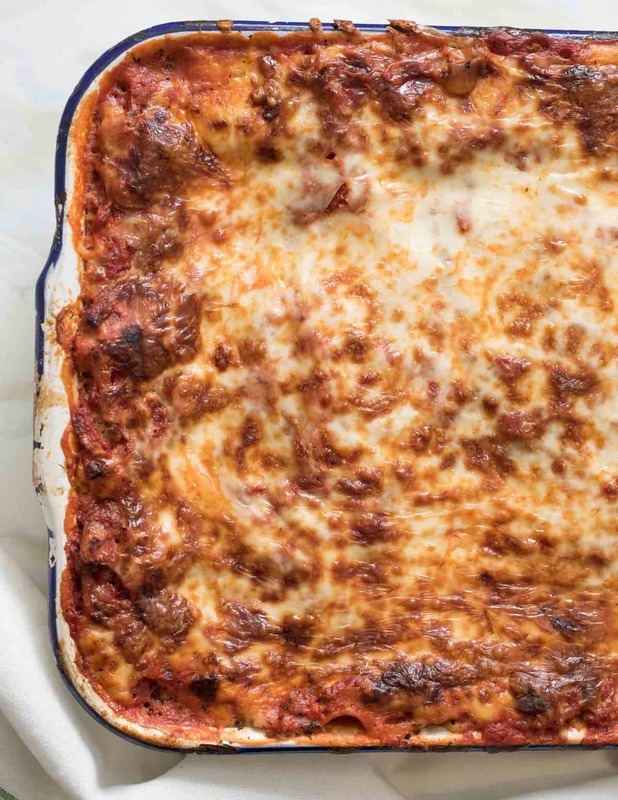 The Best Make-Ahead Lasagna recipe that is also freezer-friendly is made with a rich sausage sauce and loads of cheese. This will be your go-to lasagna recipe guaranteed! For the sauce Heat oil in Dutch oven over medium heat until shimmering. Add onion, 1 teaspoon salt, and 1 teaspoon pepper and cook until softened, about 5 minutes. Stir in garlic and cook until fragrant, about 30 seconds. Add meatloaf mix and cook, breaking up meat with wooden spoon, until no longer pink, about 5 minutes. Stir in cream and simmer until liquid evaporates and only fat remains, about 4 minutes. Stir in tomato puree and tomatoes, bring to simmer, and cook until flavors meld, about 5 minutes. Off heat, stir in basil and season with salt and pepper to taste. For the lasagna Adjust oven rack to middle position and heat oven to 400 degrees. Combine ricotta, 1 cup Parmesan, basil, egg, salt, and pepper in bowl. Spread 1 cup sauce over bottom of 13×9-inch baking dish (avoiding large chunks of meat). Lay 3 noodles in dish, spread 1/3 cup ricotta mixture over each noodle, then top with 1 cup mozzarella and 1 cup sauce (in that order). Repeat layering process 2 more times. Top with remaining 3 noodles, remaining sauce, remaining 1 cup mozzarella, and remaining 1/2 cup Parmesan. Cover dish tightly with greased aluminum foil, place on foil-lined rimmed baking sheet, and bake for 15 minutes. Uncover, and continue to bake until spotty brown and bubbling around edges, 25 to 35 minutes. Let casserole cool for 10 minutes before serving. 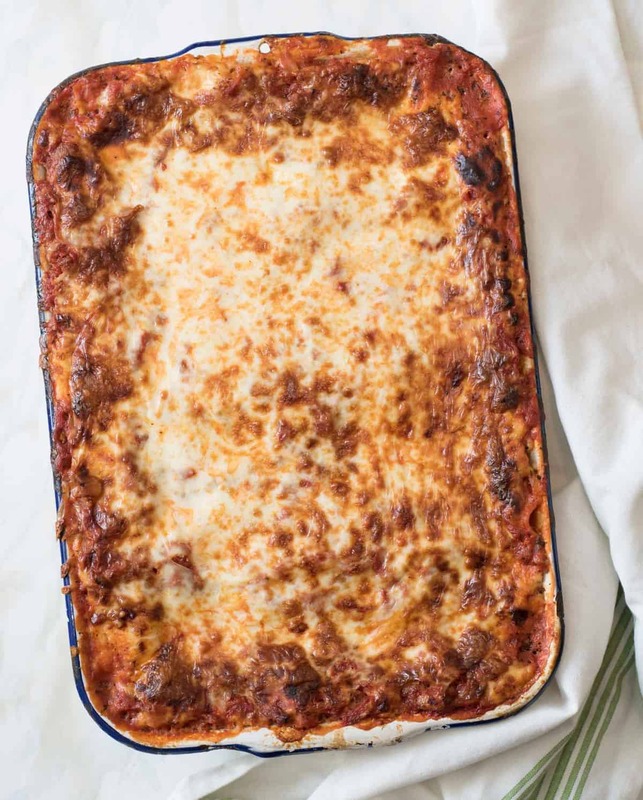 My family LOVED this make-ahead lasagna and so did every one else I took it to. It’s for sure my new go-to lasagna recipe and I know it will be yours, too. 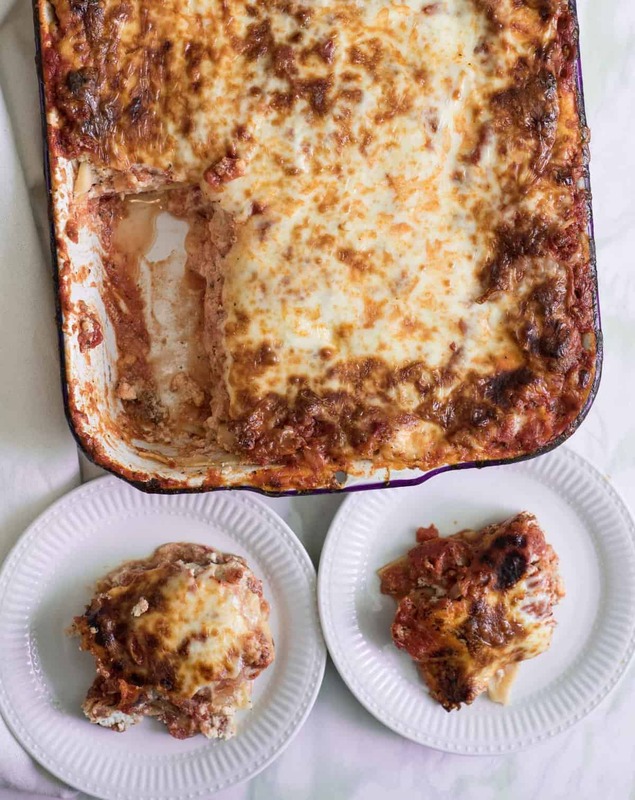 Whether you are making it ahead of time, right before dinner, or to put in the freezer, you are going to love having this amazing lasagna recipe in your life. Disclosure: America’s Test Kitchen sent me a copy of the cookbook to review but I was not paid for my time to write this review or share this recipe. I just genuinely love ATK and love sharing their books with you. I’ve never had one that I didn’t love! To freeze it, when you say wrapped tightly in plastic wrap and then covered in foil, do you mean plastic wrap tight on the top, or do you need to line the pan with it to wrap it completely? And if it’s on top, tight to the lasagna, not just tight across the top of the pan? I normally wrap the whole thing in plastic wrap and press it down onto the lasagna top too, if that makes sense. My goal is to keep the air out of it so I wrap it well! An excellent classic lasagna recipe. It’s been so long since I’ve had lasagna, but I’ve been craving it lately! Love this! This recipe sounds delicious! I can’t wait to try it. I need to prepare it two days in advance, so should I freeze it? If so when should I take it out to thaw? So it needs to thaw all of the way in the fridge… so it kind of depends on what time of day you are making it. I’d make it day 1 in the morning and throw it in the freezer, then pull it out day 2 at night and stick it in the fridge to thaw, and then bake it day three. Does that make sense? Holler if you need a little more guidance. It’s a great recipe! You’ll love it! Hey there – what if I were to cook it to save a friend in need some time? How do you recommend storing and reheating it once cooked? Thanks in advance–can’t wait to try it! You can heat individual servings in the microwave or oven really easily! I’ve found it’s easy to reheat servings instead of a whole pan after it’s been cooked if that’s helpful! Can you prepare the recipe with no boil noodles and put in fridge without baking and then bake it the next day. Yep, it’ll be great in the fridge for right around 24 hours, so feel free to make it a day ahead and keep it in the fridge until baking. Truth be told, I just did that this weekend because it was crazy, so yes, I had it in my fridge for just about 48 hours and it was still great. The pasta might be a bit “bloated” but it wasn’t so much that I wouldn’t do it again. Still tasted, cut, and cooked up great. So I’m going to say yes, make it today should be just fine until Tuesday because it worked great for me (made it Thursday, cooked it Saturday this weekend). Merry Christmas and happy lasagna making! 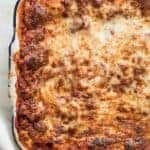 I’ve made this lasagna (as well as the spinach mushroom version) many many times – it’s absolutely delicious & foolproof…however, it serves at the most 12, not 16; & it takes forever to defrost so be sure to pull it out of your freezer at least two days ahead & leave it out at room temperature before baking it. Thanks for the tips and tricks about thawing! That’s great info to add.